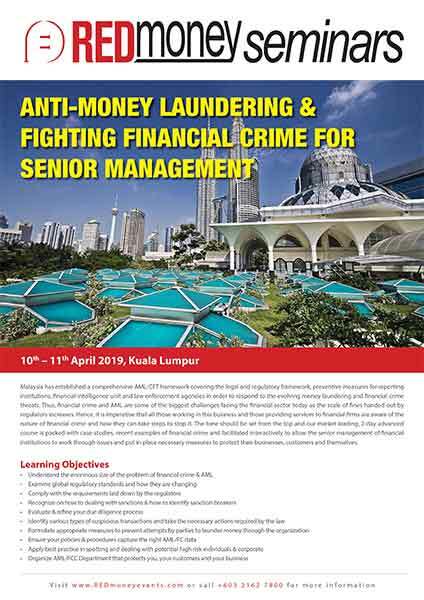 Malaysia has established a comprehensive AML/CFT framework covering the legal and regulatory framework, preventive measures for reporting institutions, financial intelligence unit and law enforcement agencies in order to respond to the evolving money laundering and financial crime threats. Thus, financial crime and AML are some of the biggest challenges facing the financial sector today as the scale of fines handed out by regulators increases. Hence, it is imperative that all those working in this business and those providing services to financial firms are aware of the nature of financial crime and how they can take steps to stop it. The tone should be set from the top and our market leading, 2-day advanced course is packed with case-studies, recent examples of financial crime and facilitated interactively to allow the senior management of financial institutions to work through issues and put in place necessary measures to protect their businesses, customers and themselves. By the end of this session, delegates will be able to name the global regulatory bodies and their functions as well as define the impact of the tightening of global regulations. Who and what are sanctioned? Why are regulators concentrating on KYC? What do regulators look for in AML structures? By the end of this session, delegates will be able to identify the key strengths and weaknesses in compliance structures and how regulators view best practice in this area. During this session, delegates will use the knowledge and skills acquired throughout the day to create a template of ‘best practice’ for identifying financial crime and dealing with issues arising from AML issues in their day-to-day job. To do this, they will work in groups but prepare their own action plan to take away. This session re-enforces the key points taught throughout the day and ensures that new skills are embedded for the future. Mark is an experienced trainer and consultant with global knowledge, having lived & worked in the UK, Russia, Qatar and India and trained in almost every country. Having started his career as a stockbroker in London, he worked for US, Dutch and UK banks as a Director in the Sales & Sales Trading departments. He then became a partner in a small investment bank where he was Head of Trading and oversaw the Compliance function. Mark has been Global Head of L&D at a Russian investment bank and at a major Middle Eastern Sovereign Wealth Fund as well as a World Cup Organising Committee. He also managed the training section of a major offshoring project to India, training over 1500 staff in settlement, custody and compliance. 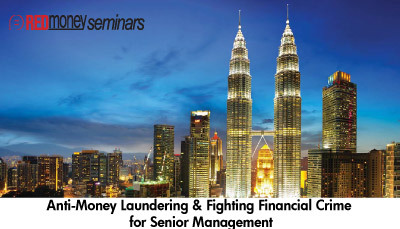 In recent years, Mark has been one of the highest rated trainers in Anti-Money Laundering & Financial Crime Compliance, training in over 60 different countries in the last 3 years, including a global AML project for one of the world’s largest banks. He has trained staff in every area of banking and finance including [but not limited to] retail & corporate banking, investment banking, SME banking, private banking, asset management, hedge funds, SWFs and associated service providers. Comfortable at all levels, he has worked with main Board members to new graduate hires and induction programmes.